There really is nothing quite as breathtaking as that first glimpse of a glittering infinity pool. That double-take moment where you have to squint and check that the sky hasn’t actually melted into a horizon of aquamarine ripples. Well, whether you’re looking for the ultimate infinity pool to really knock your sandals off (beach views and cocktail sundowners included) or if you simply want to up your Instagram game with fifty shades of blue on your feed – you’ve come to the right place. We’ve dipped and dunked our way through Bali’s very best watering holes (this time we’re talking swimming pools, not bars!) from cliff-edge designer villas with gravity-defying masterpieces, to tropical rainforest retreats with an infinite jungle oasis, here are the island’s finest infinity pools that’ll take your breath away, every damn time. So go on, dive right in – to infinity and beyond! 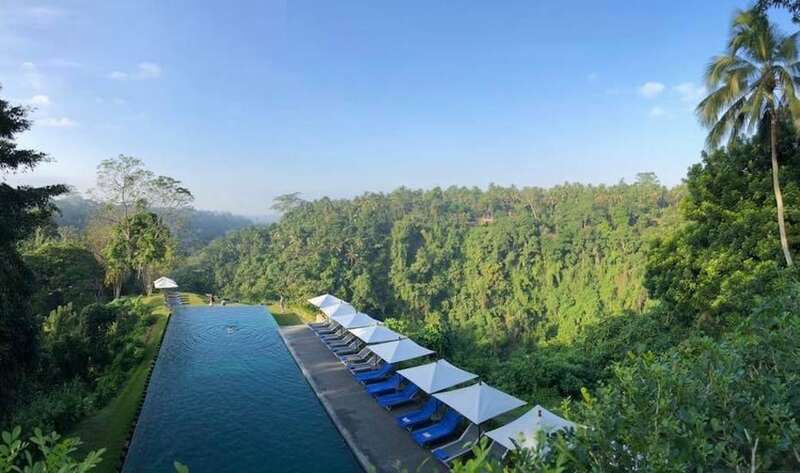 Perhaps Bali’s most famous infinity pool, this stunning multi-level masterpiece at the Hanging Gardens of Bali has been crowned “best swimming pool in the world” many times over – and you can see why. Standing tall in the jungle and towering high above the treetops, the pool’s dramatic drops, waterfalls and architecturally-perfected curves makes it an Instagram-fave. Hanging Gardens, Desa Buahan, Payangan, Ubud, p. +62 361 982 700, e. reservations@hanginggardensofbali.com. 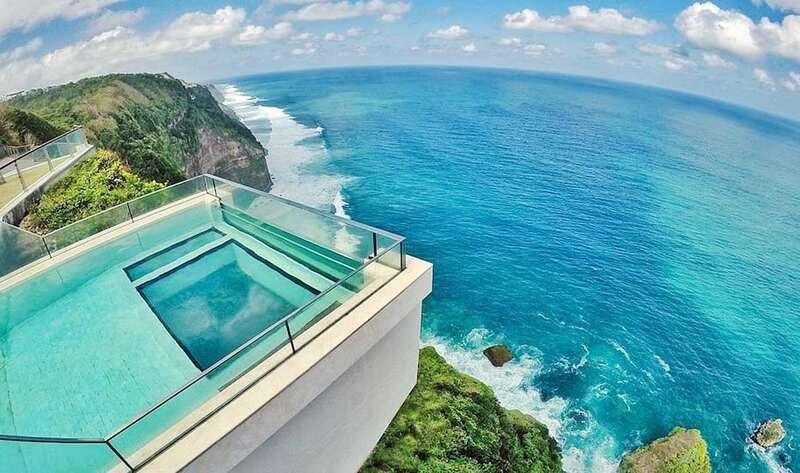 Possibly the world’s most jaw-dropping infinity pool, this glass-bottom cliffhanger at Bali’s oneeighty° cliff-club is not for the faint-hearted. Swim out to the end and look down through the glass – you’ll see the Indian Ocean crashing hundreds of feet below, met by a rugged cliff face and natural boulders… A view best enjoyed while sipping on one of the club’s carefully crafted cocktails. Oneeighty at The Edge, Jl Pura Goa Lempeh, Banjar Dinas Kangin, Pecatu, p. +62 361 847 0700, e. intouch@edge.mesahotelsandresorts.com. 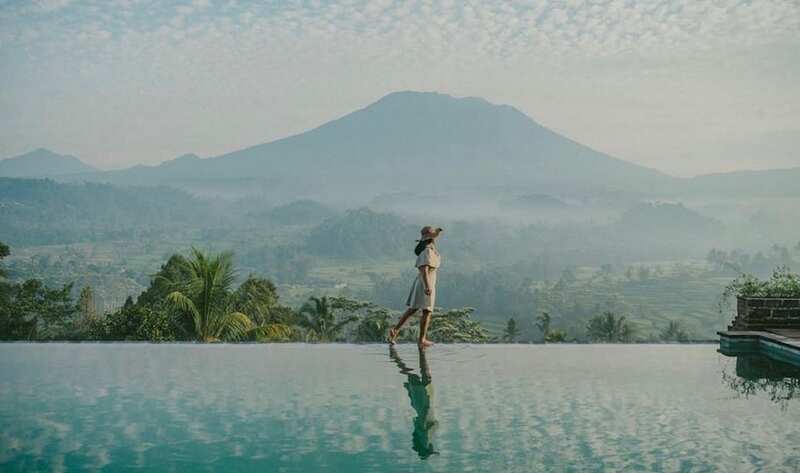 An Instagram sensation, Munduk Moding Plantation is home to Bali’s “pool above the clouds”, where the sky seamlessly merges into soft ripples, and only a faint shadow from Bali’s mountain range divides the two. 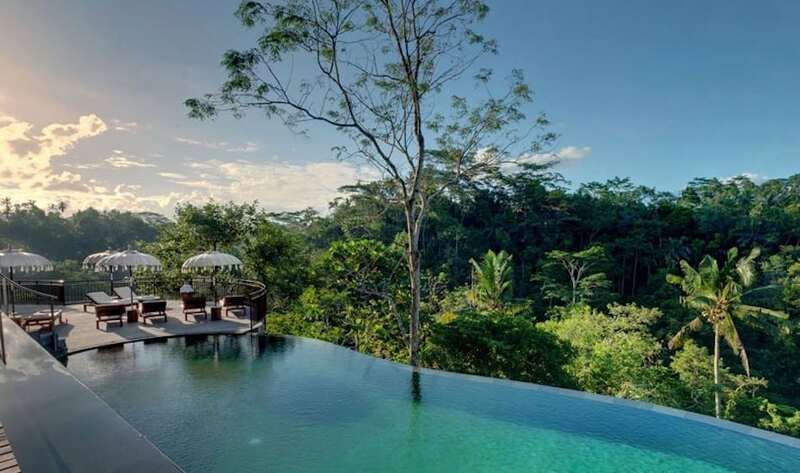 The 18 metre infinity pool centres this stunning eco-resort, with panoramic views of the jungle all around. Cloud Nine, eat your heart out. Munduk Moding Plantation, Jl Raya Asah Gobleg Banjar Dinas Asah Desa Gobleg, Kecamatan Banjar Buleleng, p. +62 81 138 5059, e. sales@mundukmodingplantation.com. 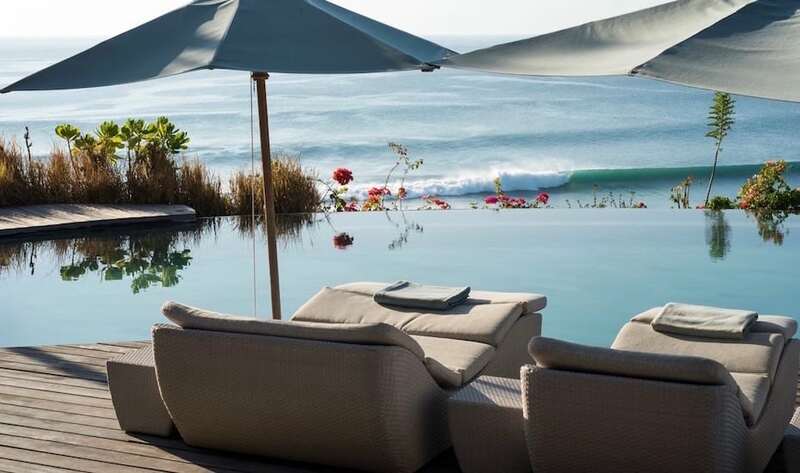 Unfurling along Seminyak’s pristine 8km stretch of white-sand beach, Alila Seminyak is a designer playground full of fabulous food, stylish suites and five-star indulgences – and it just so happens to have one of the most dazzling infinity pools around too. Settle into one of the comfy poolside lounges (conveniently close to the beach bar) and watch the sky’s reflection turn from fifty shades of blue to candy-coloured sunset hues. Alila Seminyak, Jl Taman Ganesha No. 9 Petitenget, p. +62 361 3021 888. e. seminyak@alilahotels.com. Ensconced within an untouched river valley overlooking enchanting bamboo forests, Padma Resort Ubud is a luxe jungle oasis, fronted by a lagoon infinity pool that connects to the resort via an enchanting glass-top tunnel. With refreshing mountain air all around, the water is cool during the day, then heated at night when the temperature drops to encourage dreamy sundowners at the Sunken Pool Bar. Padma Resort Ubud, Banjar Carik Desa, Puhu, Payangan, Ubud p. +62 361 752 111, e. reservation.ubud@padmahotels.com. 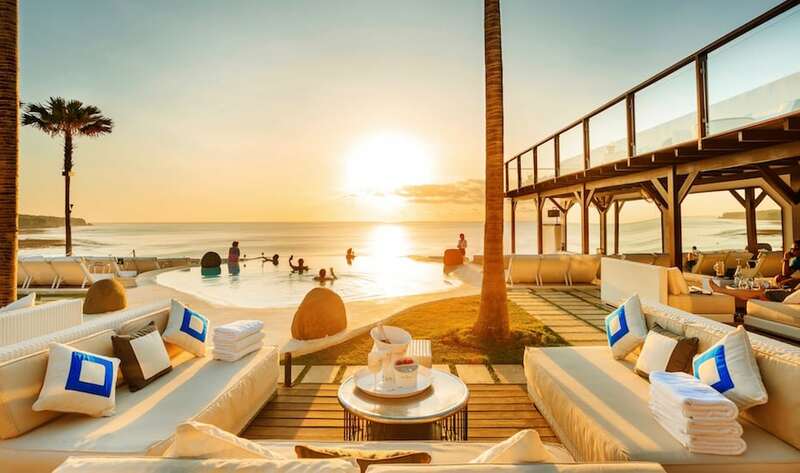 A six-star sanctuary in the sky, The Ungasan Clifftop Resort is home to a gorgeous 28-metre infinity pool on the cliff’s edge that dramatically overlooks Sundays Beach Club and the ocean horizon out yonder. But that’s not all. 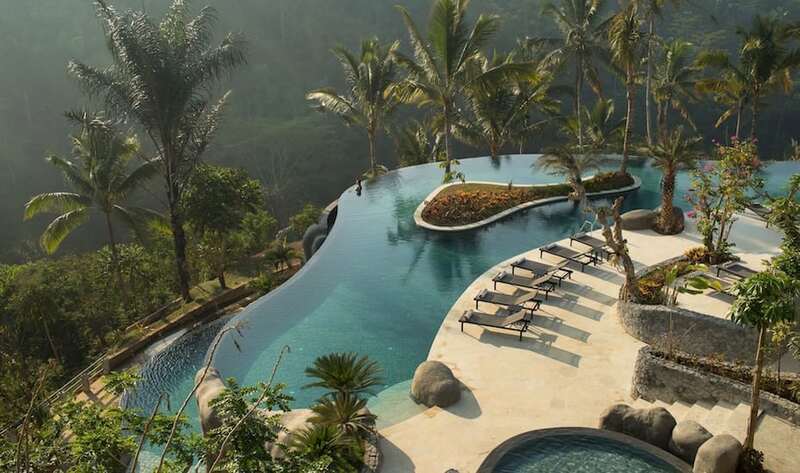 Each of the private abodes at this all-villa resort come with their very own cliff-front pools, taking ‘infinite luxury’ to a whole new level. Each one boasts 30-50 metres of cliff-top frontage, and each one is more breathtaking that the last. The Ungasan Clifftop Resort, Jl Pantai Selatan Gau, Banjar Wijaya Kusuma, Ungasan, p. +62 811 942 1110, e. reservations@theungasan.com. 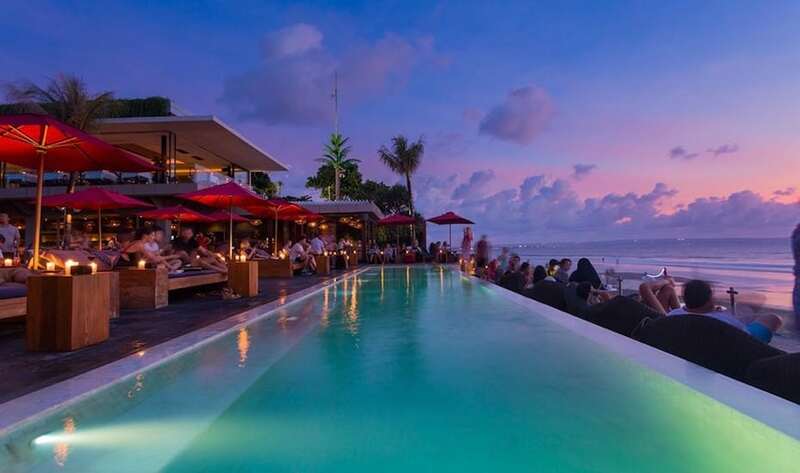 Seminyak’s original beach club and haven of beautiful people and groovy sunset vibes, KU DE TA remains one of Seminyak’s best bars to see and be seen, in part due to the beachfront infinity pool that’s flocked’s by Seminyak’s finest. 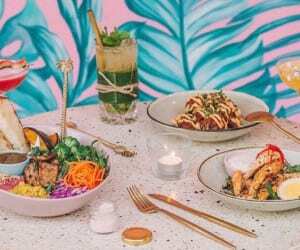 Surrounded by day beds and two trendy restaurants that both serve exceptional food, spend the day here soaking up the buzzin’ vibes while you sip and snap the afternoon away on a day bed – just be sure to make a reservation. Ku De Ta, Jl Kayu Aya no.9, Seminyak, p. +62 361 736 969, e. reservations@kudeta.com. Open daily 8am – 2am. 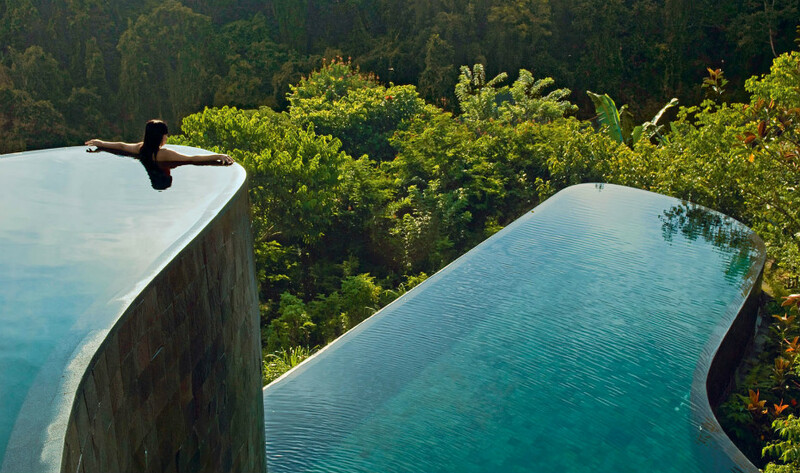 Sitting hillside on the edge of the Ayung River valley, Alila Ubud and its mystical infinity pool looks as if it hangs over the edge of the lush green gorge. Take a dip here and you’ll easily lose yourself in the calmness of the tropical green jungle all around, or lounge poolside and gaze at the sky’s reflection mirrored in beautiful emerald shades. Alila Ubud, Desa Melinggih Kelod, Payangan Gianyar, p. +62 361 975 963, e. ubud@alilahotels.com. 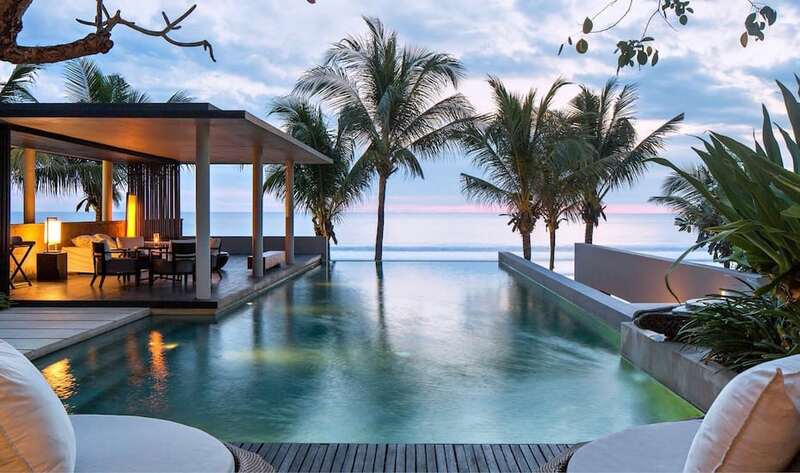 Surrounded by beautifully landscaped gardens, the 16m three-tiered infinity pool at The Legian Bali is pure luxury, sitting directly in front of the resort on the Seminyak beachfront. Watch the world go by from the comfort of a poolside sun-lounger, or take a dip at sundown for the most magical glow. 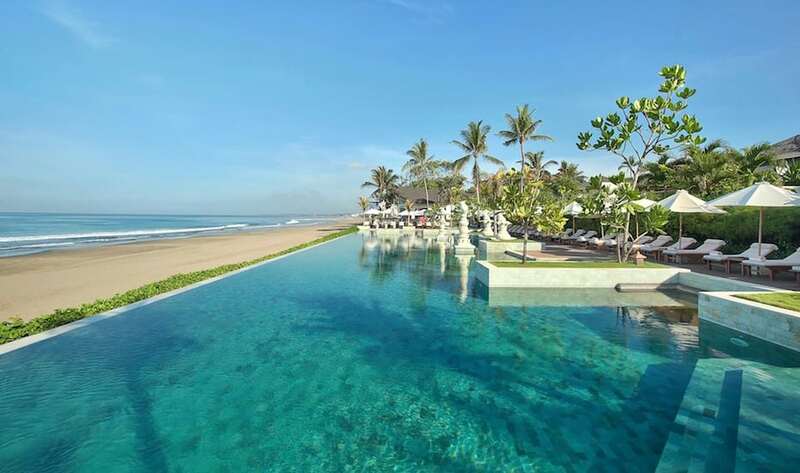 The Legian Bali, Jl Kayu Aya, Seminyak Beach, p. +62 361 730 622, e. legian@lhm-hotels.com. 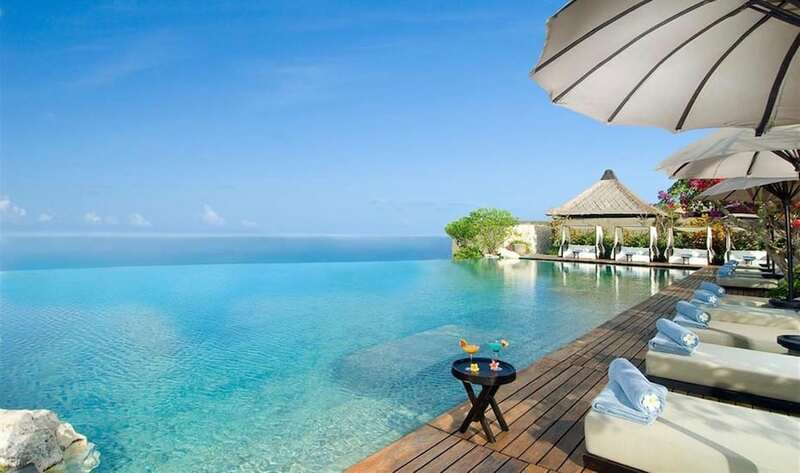 With a beachfront infinity pool tucked in a private bay, plus a two-tiered freshwater pool and luxury villas with their own infinities, you’re spoilt for choice at AYANA Resort & Spa Bali. Each of these tropical oases are nestled within this private and sweeping sanctuary, fringed by greenery and sheltered by swaying palms. Pure bliss! AYANA Resort & Spa Bali, Jl Karang Mas Sejahtera, Jimbaran, p. +62 361 702 222, e. info@ayanaresort.com. Step through the Colosseum-esque arena of Potato Head Beach Club, and you’ll find a beachfront infinity pool that’s positively thronging with sun-soakers, island addicts and partygoers alike. Punctuated by a sunken, circular pool bar (slinging some of the best cocktails around) this beach club’s pool comes dotted with daybeds and sun loungers for all-day lolling. Turn up before lunchtime to claim the best pool-side real estate, and stick around until golden hour for one of Bali’s best sunset seats. 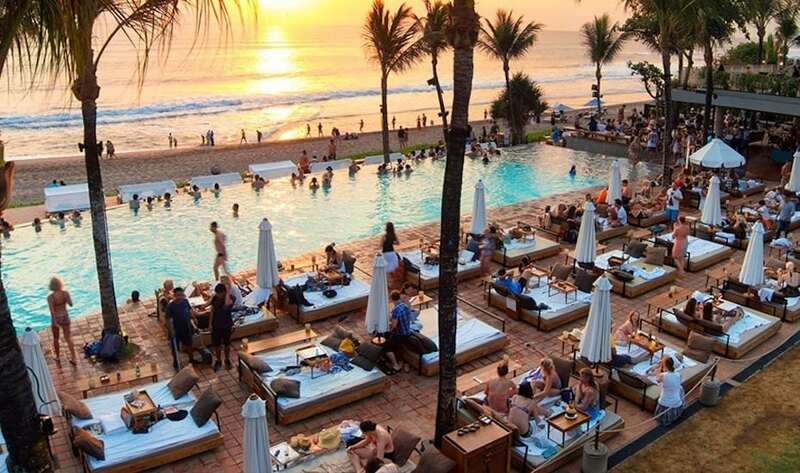 Potato Head Beach Club, Jl Petitenget, Seminyak, Bali, p.+62 361 473 7979, e. phbc.reservation@pttfamily.com. Open daily, 10am – 2am. 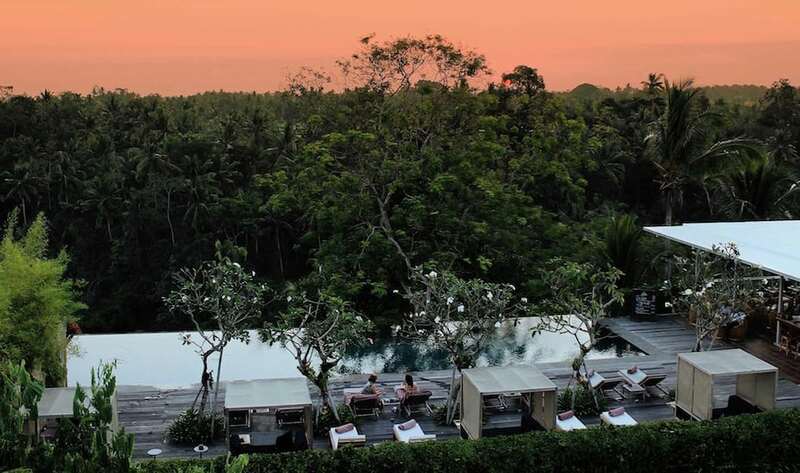 Rooted on the edge of the Ubud jungle, the infinity pool at Bisma Eight divides untouched nature on one side, with boutique luxury to the other. It’s a glorious meeting of modern aesthetics with Mother Nature, where cosy cabanas and sun lounges fringe the pool which is heated to a perfect temperature by nightfall. Bisma Eight, Jl Bisma, Ubud, Bali. p. +62 361 4792888, e. info@bisma-eight.com. 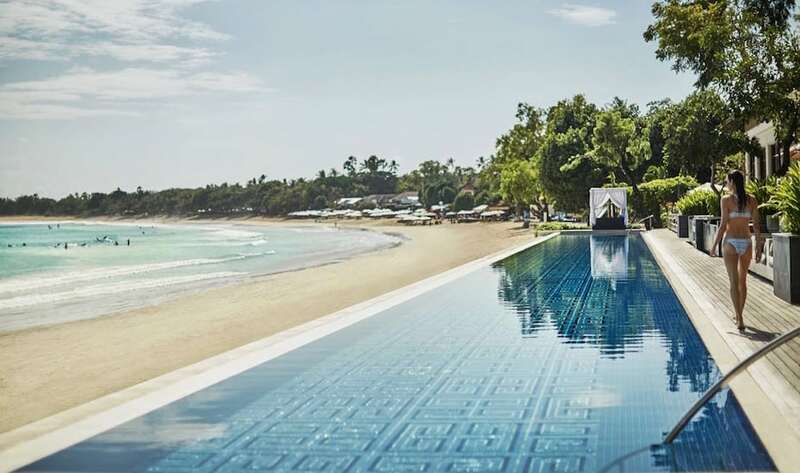 With Mount Agung behind you and pumping waves in front of you, the beachfront infinity pool at Komune Beach Club is a sight to be seen indeed. Sitting on the east coast away from the crowds, this resort and beach club combo sits on a black sand beach, surrounded by oceanfront day beds and scrummy coastal fare. At dusk, nighttime surf sessions take centre stage right in front of the glowing pool. Komune Beach Club, Jl Pantai Keramas, Gianyar, p. +62 361 301 8888, e. reservations.bali@komuneresorts.com. The Sanskrit word for “beautiful’, Sundara at Four Seasons is exactly that. 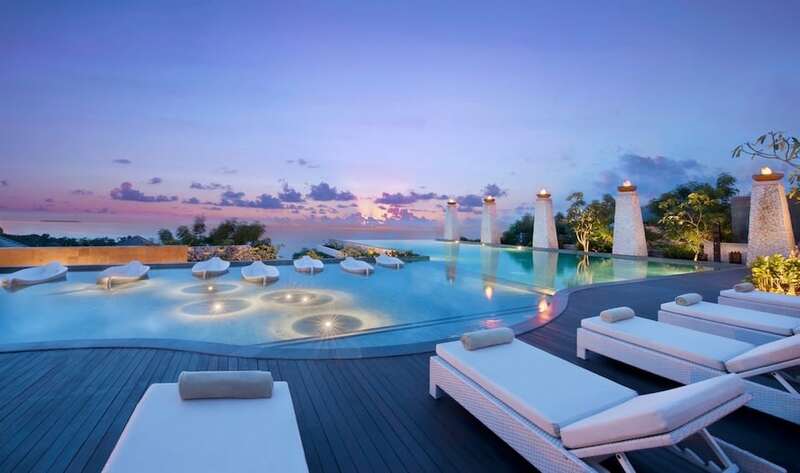 Situated on the curve of Jimbaran Bay, you can relax in the double daybeds around this impressive 57-metre pool, sip on avant-garde cocktails, and appreciate the view of the pool merging into the ocean behind it. Swing by on a Sunday and pair your pool hangs with Bali’s longest Sunday brunch. Sundara at Four Seasons Resort Bali at Jimbaran Bay. p. +62 361 708 333, sundara.bali@fourseasons.com. Sitting 70 metres above sea level on the tip of Bali’s southern peninsula, the chic lagoon-like infinity pool at The Banyan Tree comes with ocean views all around. Where water meets water, swim to the uttermost end of this 10 metre pool and you’ll feel like you’re on top of the world. Banyan Tree Bali, Jl Melasti, Banjar Kelod, Ungasan, p, +62 361 3007 000, e. ungasan@banyantree.com. This is what architectural dreams are made of. Aptly named “The Oasis”, this infinity pool at The Mulia, Mulia Resort & Villas is just one of four stunning pools at this award-winning resort, centrally positioned by the beach and reserved exclusively for guests. It’s lined by contemporary statues of Balinese ladies carrying flowers – a symbol of Bali’s daily rituals and prayers that make the island so special. Love! 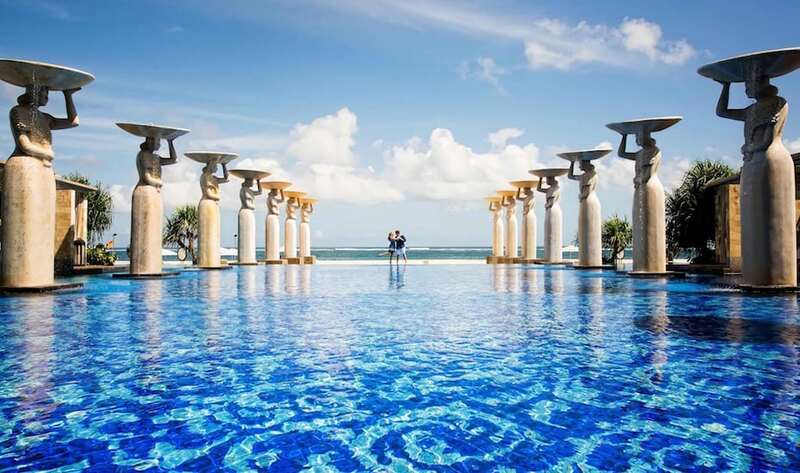 The Mulia, Raya Nusa Dua Selatan, Kawasan Sawangan, Nusa Dua, p. +62 361 302 7777. 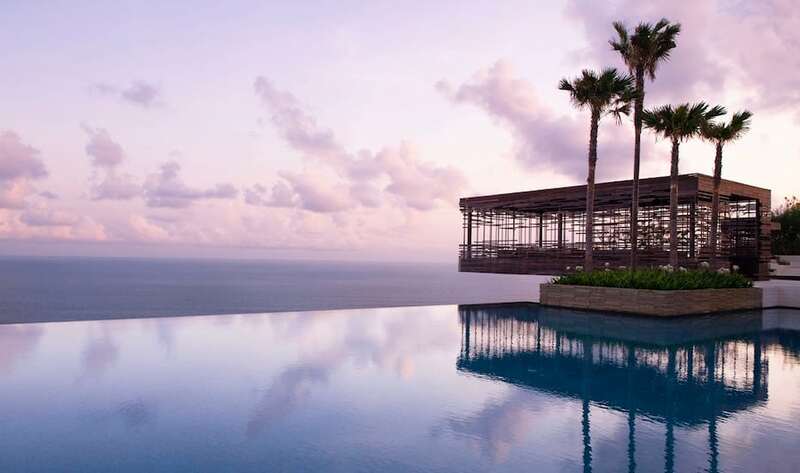 This jaw-dropping 50-metre infinity pool at Alila Villas Uluwatu may well be Bali’s most iconic yet. 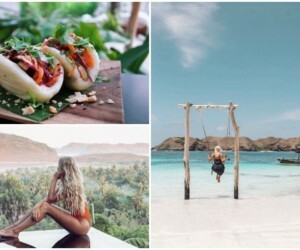 Defying gravity and stretching far out over the limestone cliffs, the views here are truly breathtaking – as are the Instagram opportunities. Contemporary, luxurious and oh-so dreamy, come here for a seriously suave sundowner or two. 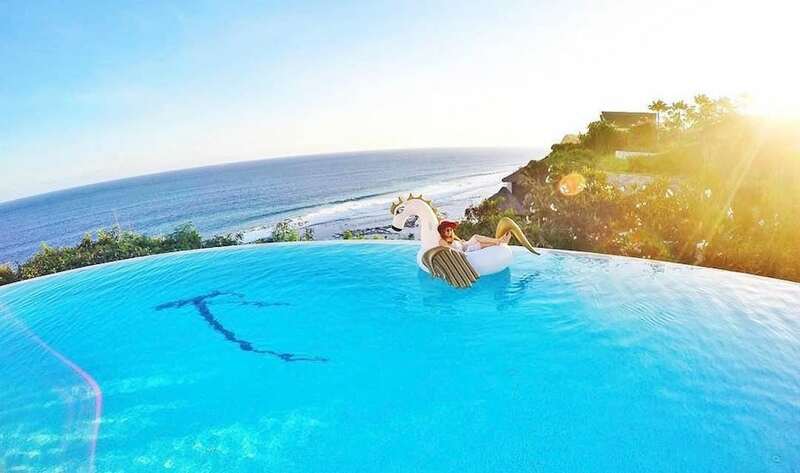 Alila Villas Uluwatu, Belimbing Sari, Banjar Tambiyak, Desa Pecatu, Uluwatu, p. +62 361 84821661. 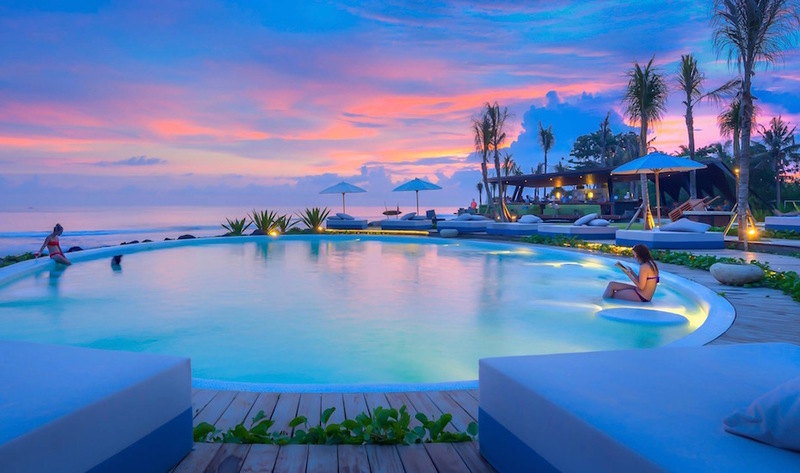 There are plenty of sunset-paparazzi spots in Bali, but El Kabron is one of Bali’s very best. The stunning infinity pool takes centre stage here, with lounges and chairs all around to sip on Sangria and let the Spanish flare of El Kabron transport you from a sunny afternoon through to a dazzling night beneath the stars. It’s an incredible location overlooking Bingin’s waves and hidden bays. El Kabron, Pantai Cemongkak, Bingin, Pecatu, p. +62 821 4437 0139, e. info@elkabron.com. 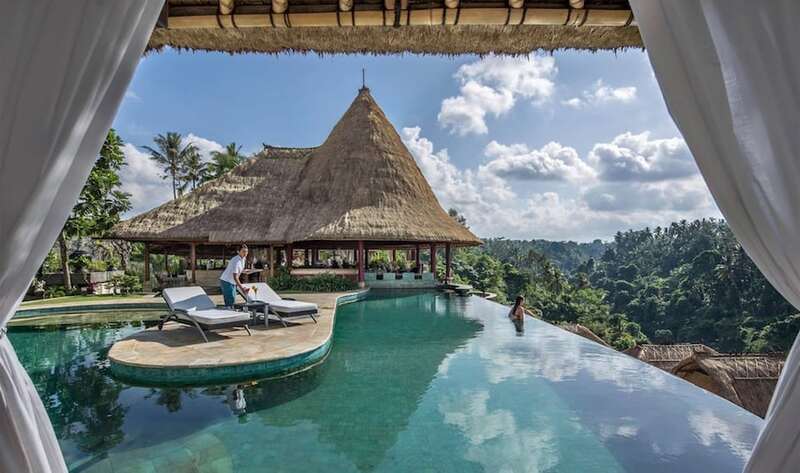 A luxurious Ubud hideout, The Viceroy Bali is nestled in the ‘Valley of Kings’ – named after the many Balinese royals who have lived close by. 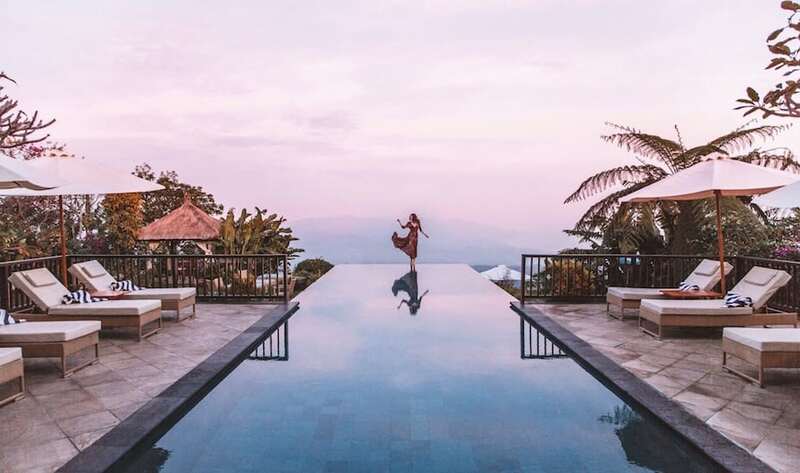 Well, you too will feel like royalty here, dipping into the dramatic infinity pool that features a fountain and swim-up bar overlooking the spectacular Petanu Valley. Where the pool edge meets the tree tops, you feel like you’re swimming with the birds. Or simply cosy up in the chic poolside gazebos complete with romantic soft white cushions and curtains. The Viceroy Bali, Lanyahan, Banjar Nagi, Ubud, Kec. Gianyar, p. +62 361 971 777, e. res@viceroybali.com. With three blue hues all around you – the ocean, the sky and the pool’s shimmering water – Karma Kandara is the place where postcards are made. Watch the sun set as you float on the water and take in the picture-perfect scenery, or settle in for a seaside-inspired feast at Di Mare restaurant, sitting directly next to the infinity pool’s edge. Karma Kandara, Jl Karma Kandara, Banjar Wijaya Kusuma, Ungasan, p. +62 361 848 2202, e. res@karmaresorts.com. A pool club in the jungle? Sign us up. Jungle Fish sits high up in the treetop canopies of Ubud’s jungle, with its splendid 35 metre pool fringed by natural accents and cute sun-soaking nooks. Bask in the water, enjoy a cocktail from the pool bar, and laze the day away with gourmet nibbles aplenty. Jungle Fish, Jl Raya Sebali, Ubud, p. +62 361 898 9104, e. reservations@junglefishbali.com. 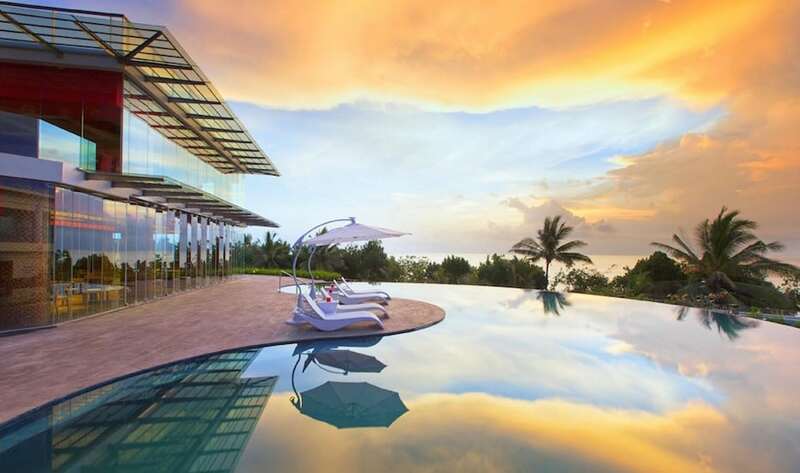 Standing tall on the edge of Uluwatu’s limestone cliffs, the Bvlgari Resort is nothing short of a six-star showpiece. Where pool meets sky, you’re taken to a tropical Nirvana and back again with a dip into their elite resort luxuries. This is a stand out destination and definitely one for the bucket list. 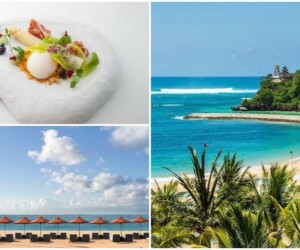 Bvlgari Resort Bali, Jl Goa Lempeh, Banjar Dinas Kangin, Uluwatu, p. +62 361 8471 000. 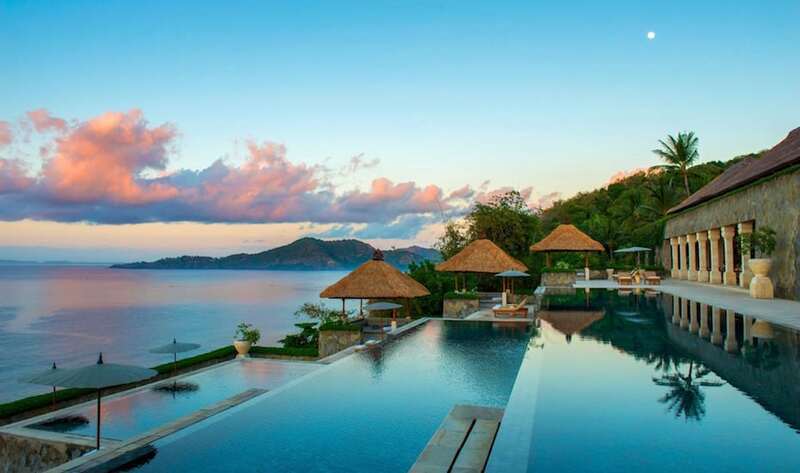 Built on a hillside, this three-tiered infinity pool at Amankila is a nod to Bali’s rice paddy landscapes, topped off with an azure ocean backdrop and views of the Lombok strait out yonder. You’ll want to wake up early to capture this aquatic beauty – it sits on the East Coast so you have front row sunrise seats here. Amankila, Manggis, Karangasem, p. +62 361 41333, e. amankila@aman.com. Suarga Padang Padang, Jl Pantai Labuan Sait, Br. Dinas Labuan Sait Pecatu, Padang Padang, p. +62 361 472 5086, e. info@suarga.com. Hidden in a lush paradise beside the Ayung River, this remarkable resort has been recognised as the No.1 Hotel in the World for 2018, and it’s easy to see why. Laced in luxury and architecturally designed in the shape of a rice-bowl, the resort is fronted by a double-level infinity pool that’s nothing short of breathtaking. Facing the jungle and looked upon by towering palms, days lazed here are pure paradise. Four Seasons at Sayan, Jl Raya Sayan, Ubud, Kec. Gianyar, p. +62 361 977 577. If there’s one thing all Komaneka Resorts are known for (besides their Balinese touches and sublime hospitality) it’s their fabulous infinity pools. All 5 resorts in Bali come with gorgeous dipping spots and stunning views. 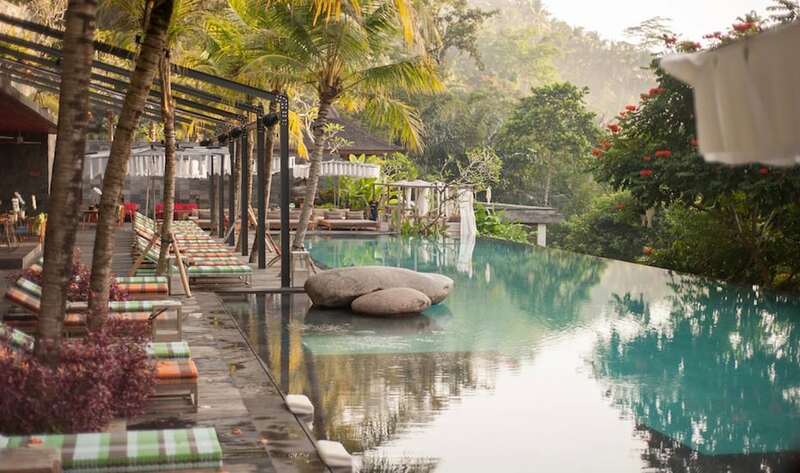 Our fave is the infinity at Komaneka at Tanggayuda (pictured above). With lush greenery all around and the most adorable sundeck with decorative white umbrellas, this pool will add some serious WOW-factor to your Insta-feed. Komaneka at Tanggayuda, Banjar Tanggayuda, Kedewatan, Ubud, p. +62 361 978123, e. reservation@komaneka.com. Is it an ocean? Is it a lake? No, it’s The Seminyak Beach Resort’s dazzling infinity pool, stretching 45 metres across Seminyak’s white sand coastline. Fringed by sunbeds and graced by a sunken pool bar, you never have to leave this sweeping oasis if you so choose. Hallelujah! 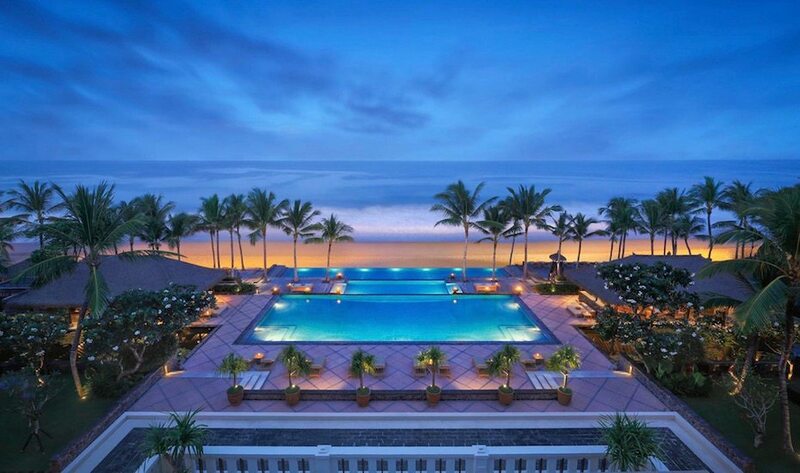 The Seminyak Beach Resort & Spa, Jl. Kayu Aya, Seminyak Beach, p. +62 361 730814, e. info@theseminyak.com. 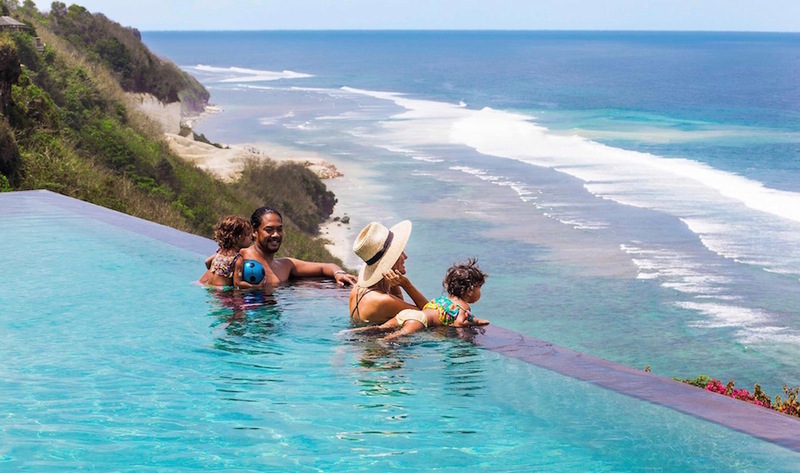 Perched up on the Bingin cliffs with 180 degrees of unencumbered Indian Ocean views, Mick’s Place is all about soaking up the best bits Bingin Beach has to offer, best enjoyed from its tropical, terraced gardens and infinity plunge pool – which just so happens to sit in direct sight of Bingin’s world-class waves. Mick’s Place, Jl Pantai Bingin, Pecatu. You’d never guess that the bustle of Kuta Beach was below this oh-so tranquil oasis at Sheraton Bali Kuta Resort. A world away from the bars, boutiques and buzz of Kuta’s busiest beachfront strip, this curvy, infinity-edge pool is a welcome rooftop reprieve, compete with the silhouettes of palm trees as your sunset backdrop. 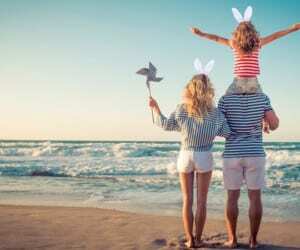 Sheraton Bali Kuta Resort, Jl Pantai Kuta Beach, p. +62 361 846 5555. Patal Kikian Villas, Banjar Kikian, Sidemen, Karangasem, p. +62 81 3532 78504, e. info@patalkikianvillas.com.